Error in setting the penetration depth of the machine piercing holes in the surface soil to sow the grass, causes several dozens local damages of the heating pipes. Most of the damages are visible in a form of pools. After mending all visible leaks, pools disappear from the surface of the lawn, but a lot of water still escapes from the system. 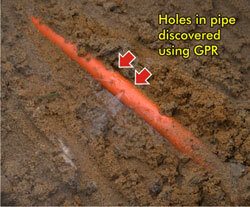 Even geofon – special device to detect bigger leaks – seems to be useless. Full- scale football stadium. Over 30.000 heating pipes. 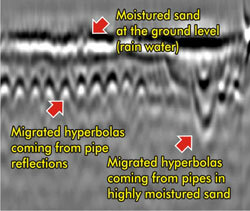 Pipes lie in a small distance from each other – 25 cm. 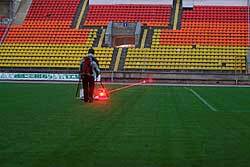 To minimize the possibility of wrong aerials leading exact laser tracking was used. There were made 364 profiles at 30 cm intervals, covering whole stadium that is over 7700 square meters. One of the excavation confirming accuracy of the research.